Because apparently it is a war, according to the good people over at Twitter. The #MarvelEvent tag was flooded with “Oh Marvel Wins, DC loses” crap, which is always entertaining to see. Anyways let’s get into a breakdown of the films Marvel has announced (and how they announced it) with a little bit of analysis for what it all means for their biggest competitor WB/DC. Okay let me preface this by saying that it’s not secret that I’m more of a DC fan (hello it’s even in my header), but at the end of the day I love all comic book films! But unfortunately I do not have the extensive knowledge about Marvel that I do have about DC characters, so a lot of these movies I have little to no knowledge about what the heck they can be about, but taking it at face value I’m going to tell you what I see. Captain America: Civil War May 6, 2016. So we already know about this one and I have already talked about it as you can read here. So there isn’t much to say other than it will become the launching pad for the ultimate evolution and progression of the Marvel Cinematic Universe. Doctor Strange November 4, 2016. Guardians of the Galaxy 2 May 5, 2017. This is the last one on the list that we already knew about. So again not much to say except it’s a no brainer. Guardians of the Galaxy is the highest grossing comic book film of this year, so of course they are going to want to get this one out as soon as possible. Thor: Ragnarok July 28, 2017. Thor The Dark World in my opinion was a bit of a let down. I loved the first Thor but felt the second one was ruined by the stupid, 2-dimensional villain. Hopefully the third (and presumably last) Thor film will improve on it’s predecessor. Black Panther November 3, 2017 starring Chadwick Boseman. Okay so here’s when the Marvel vs DC talks really start coming in. Marvel copped a lot of criticism when DC announced their film slate. There was a lot of discussion about DC infusing their cinematic universe with diversity, whereas the Marvel Cinematic Universe was mainly lead by white-blonde haired Chris’s. Well now Marvel has punched that criticism in the face by announcing the Black Panther film, with the announcement of the actor, just in case anybody was worried they would cast a white guy to play him (because apparently these are very real fears of people). Of course they weren’t going to do that, and now with the announcement of this film we can see that Black Panther is in fact coming out before the Cyborg solo film. Sorry DC! But Marvel got you on this one, but really they didn’t because it’s great to see both universes bringing in diversity into their films. Captain Marvel July 6, 2018. Now don’t say that Marvel are sexist bastards anymore, because they announced a solo female-led superhero flick! We all expected it to be Captain Marvel, so it’s great they have finally committed. Of course the Wonder Woman solo film is coming out 1 year before this film, which I’m sure they considered before dating the film. The solo Wonder Woman film will let the audience become more comfortable with a solo female-led film, paving the way for the general audience to get really excited for the next female-led film, Captain Marvel. Many people were outraged that Black Widow was not getting a stand alone film, but honestly I can’t see her character being able to support her own movie. A character like Captain Marvel will bring something different to the universe, and all this Kree stuff has already been layed out in the films and in Agents of Shield, so it makes sense to give her her own film. Another heavily rumoured film has become a reality. Half of the announced Marvel film slate are team-up movies, and it’s no surprise. Films such as X-men and Guardians of the Galaxy do really well by introducing to the audience a plethora of characters with their own individual quirks and qualities. Team dynamics are always fun to watch, so this film does have a lot of potential. Now granted I really know nothing about Inhumans, and I still am pretty excited for this film purely because it isn’t a solo character movie. Oooh finally the Thanos story arc comes to a close in The Avengers Part 1 and Part 2, which are going to be released only a year after each other! Now that is crazy. It’s interesting that they too are going with the Part 1 Part 2 thing, after we heard Justice league will be broken up into 2 parts. Also the Justice League Part 2 and The Avengers Part 2 are coming out in the same year, now that is just pure crazy! What a year, if they are going to end with a cliffhanger, at least we won’t have to wait a long time before the next film. 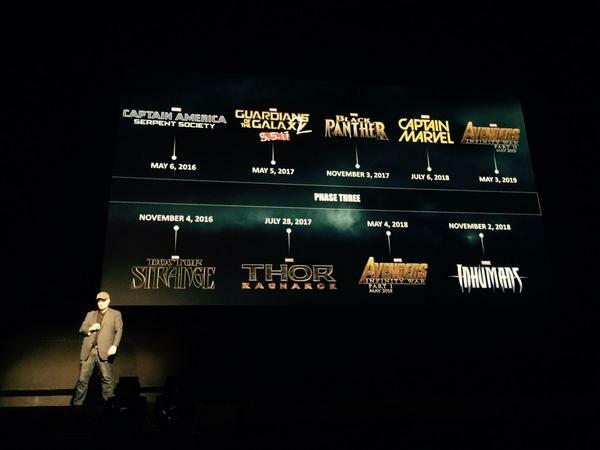 So there you have it, the Marvel Film slate up until 2019. I wish I could write more about it now, but I have to run out of the door to get to uni!! Anyways what do you think about the slate? Any one movie in particular you’re excited for? Let me know! Great article!! Yeah, I had a bit of a meltdown at the event and I think seeing Chadwick Boseman being a blockbuster lead is pretty damn exciting 🙂 I think Captain Marvel is probably what I am most excited for because I definitely think we need to start seeing female superheroes. Haha I know I have read every article you wrote, even I am overwhelmed. I hope that they cast someone who isn’t a obvious choice. I think Emily Blunt or Katee Sackhoff and even Jennifer Lawrence is way too obvious. I want someone who doesn’t do action films but fits the divining qualities of the character. You think so? I think Feige may be done with announcements until Avengers 2 comes out. At least it seems that way! I think it’s interesting how they didn’t focus much on the Netflix shows or any of the ABC shows either. I think they may be left up to how much impact they emit. I am not a comic book reader, but I like watching those movies – though I am harder to please than the average comic book fan. But the MCU has me. Big time. I think the whole DC vs Marvel discussion is a little bit silly. Both of them have been and will be again ahead at one point. But when we are talking movies…Marvel is way ahead of DC. DC really needs to rethink the “gritty” approach a little bit, and they shouldn’t scramble around trying to do what Marvel does. And when I say that I do because I want them both doing well. I want this Wonder Woman movie to succeed, but I fear it wont, especially not if DC goes with a “we are looking for a female director” mind-set into it. I disagree with you concerning Black Widow. She could certainly carry her own Spy movie, and I am very disappointed that we won’t get one. Oh well. And the race for the first black lead Superhero movie…that was decided years ago with the Blade movies. 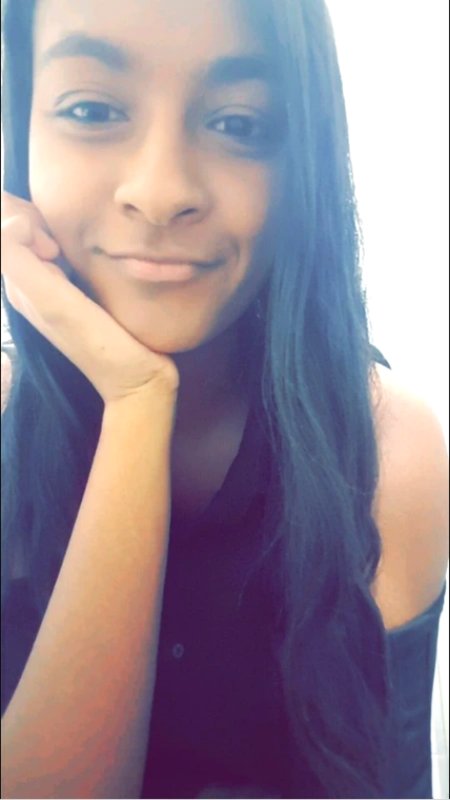 So I am kind of amused that so many people act as if that was never done before. It’s great that they introduce some new heroes into mainstream media. Always appreciated. You’re right about the the race for the first black lead superhero movie, but I guess everyone is just looking at the ‘modern age’ superhero films which started from the Marvel cinematic movies, just how people consider Wonder Woman to be the first solo female superhero movie even though we got Elecktra. But yeah it’s good to see new characters other than the normal ones we see all the time, it’s an exciting time! I think the question is less if there never was a female lead comicbook movie (unless I overlooked one there have been five so far, six if you count Barbarella), and more if we finally get a good and successful one. Never mind that Wonder Woman has been in development for decades. Blade already was successful, therefore there is a little bit less to proof on this front. I don’t mind gritty in itself, but I do mind “totally devoid of any hope”, especially in a Superman movie (I can’t express enough how much I hated Man of Steel). And DC has to pay attention that they don’t put style over story. It is great when they tackle thought provoking themes…but they should show them, not discourse about them. In the end, I still want a good story. Take the Winter Soldier. The movie is everything but upbeat. It also addresses some important questions, which are not abstract, but something we really have to think about today and in real life. And it does so by showing the view of two very different characters, one idealistic and one very pragmatic. And in the end, they insert a moment of hope. I am not saying that DC should copy Marvel, but that is what their movies are currently lacking: a message of hope. And that is true for the TV shows, too. I wonder why anyone would want to even life in Gotham or Starling City, never mind bothering to defend either place. Everything goes to the extreme. Oh well…if for nothing else, I am very thankful that Marvel prompted DC to pull some other heroes beside Batman from their shelves. As for Winter Soldier I completely agree with you, that was 100% my favourite film of the Marvel universe, especially because for once the stakes felt real because they took a more serious tone, whilst not loosing that Marvel flavour. But yeah overall I think that Marvel can learn from DC and DC can learn from Marvel, and as long as they keep challenging each other, we keep getting good movies. Well, there is also Guardians of the Galaxy…I adore the movie. But comparing it to the Winter Soldier is pretty much pointless. They are too different and it is pretty much a matter of taste and mood which is the better one. For me Man of Steel has such a long list of aspects I didn’t like (the shaky cam, the pathos, the religious imagery, the overlong action scenes, the lack of character building, the plot contrivances), it is my least favourite Superhero movie (well…second least after Catwoman). Objectively speaking t is certainly not the worst out there, how could it with nonsense like Howard the Duck in the running. But something about this movie rubbed me entirely the wrong way. Fair enough, it’s definitely one of the more divisive superhero films but you seem to really hate it, I freaking love it and it’s my 2nd favourite superhero movie after Dark Knight, haha so we have pretty opposing opinions about MOS but that’s cool, it all makes for an interesting conversation. Tastes differ…I might be the only one who thinks that The Amazing Spider-man is the best Spider-man of them all. Sadly that doesn’t change the fact that the reboot is struggling with the audience. MoS is very controversial, and I think it will be difficult to built a Universe on this movie. Dawn of Justice has to be really convincing or I see the entire slate of DC in Danger.